The Eurocopter HH-65 Dolphin is a twin-engine, single main rotor, MEDEVAC-capable search and rescue (SAR) helicopter operated by the United States Coast Guard (USCG). It is a variant of the French-built Eurocopter AS365 Dauphin. 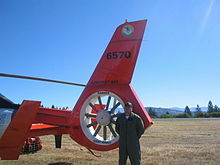 The SA366 G1 Dauphin version was selected by the United States Coast Guard in 1979 as its new short range recovery (SRR) air-sea rescue helicopter, replacing the Sikorsky HH-52A Sea Guard. In total 99 helicopters, optimised for the USCG’s search and rescue role tasks and given the designation HH-65A Dolphin, were acquired. Unlike the HH-52, the HH-65A is not able to perform water landings. The HH-65 normally carries a crew of four: Pilot, Copilot, Flight Mechanic and Rescue Swimmer. 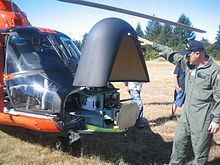 The Dolphin was manufactured by Aerospatiale Helicopter Corporation (later American Eurocopter) in Grand Prairie, Texas. Lycoming LTS101-750B-2 turboshaft engines were selected for the twin engine powerplant whilst Rockwell Collins manufactured the HH-65’s avionics in Cedar Rapids, Iowa. The HH-65 Dolphin is used for homeland security patrols, cargo, drug interdiction, ice breaking, military readiness, pollution control, and search and rescue missions. The HH-65 is known for its Fenestron tail rotor and its autopilot capabilities, which can complete an unaided approach to the water and bring the aircraft into a stable 50 ft (15 m) hover, or automatically fly search patterns, an ability which allows the crew to engage in other tasks. In order to comply with U.S. regulations relating to local content (based primarily on the value of individual components of the aircraft), engineering changes were required—notably, the SA365’s original Turbomeca Arriel engines were replaced with LTS101-750B-2 powerplants, which at the time were required to be American. Unfortunately, initial teething problems with this engine worsened as the HH-65’s weight grew, resulting in several in-flight loss-of-power events. The USCG funded a program to improve engine reliability, but the resulting LTS101-850 failed to meet expectations. In 1994, the USCG therefore held a fast-track competition to select a new powerplant, and in March 2004 the Guard announced the selection of the Turbomeca Arriel 2C2-CG, already installed on the EC155. This upgrade began in 2004, and has resulted in a safer and more capable aircraft. These modified HH-65As and HH-65Bs, which also gained new avionics and other enhancements, have been designated as HH-65Cs. The HH-65A’s minimum equipment requirements exceeded anything previously packaged into a helicopter weighing less than 10,000 pounds (4,535 kg). Seventy-five percent of the HH-65’s structure—including rotorhead, rotor blades and fuselage—consists of corrosion-resistant composite materials. Also a unique feature of the Dolphin is its computerized flight management system, which integrates state-of-the-art communications and navigation equipment. This system provides automatic flight control. At the pilot’s direction, the system will bring the aircraft to a stable hover 50 feet (15 m) above a selected object. This is an important safety feature in darkness or inclement weather. Selected search patterns can be flown automatically, freeing the pilot and copilot to concentrate on sighting & searching the object. A distinctive feature of the MH-65 is its fenestron ducted-fan anti-torque device. The fenestron consists of 11 blades spinning inside a circular housing at the base of the helicopter’s tail fin. Certified for single-pilot instrument flight rules (IFR) operation, the HH-65A was the first helicopter certified with a four-axis autopilot, allowing for hands-off hover over a pre-determined location. The Dolphin is usually deployed from shore but it can be deployed from medium and high endurance Coast Guard Cutters, as well as the Polar Icebreakers. The Dolphin’s main jobs are: search and rescue, enforcement of laws and treaties (including drug interdiction), polar ice breaking, marine environmental protection including pollution control, and military readiness. The MH-65 is also used to patrol the Air Defense Identification Zone (ADIZ) around Washington, D.C., also known as the National Capital Region (NCR). Seven new-build MH-65Cs were acquired for this mission. Initial USCG version, powered by two 734 shp (547 kW) LTS101-750B-2 turboshaft engines and with an 8,900 lb (4,000 kg) MTOW. Avionics upgrade undertaken on a portion of the fleet. Retrofit included an NVG-compatible integrated flight management avionics suite consisting of two GPS-embedded CDU-900G control display units and two MFD-255 multifunction flat panel displays. The HH-65B upgrade was undertaken at the Coast Guard’s Aircraft Repair and Supply Center (ARSC) in Elizabeth City, NC, with the first aircraft rolling-off the post-depot maintenance (PDM) line in March 2001. HH-65A/B upgraded with new 934 shp (696 kW) Arriel 2C2-CG engines that provide 40% more power and higher performance, plus an upgraded tail gearbox, long-nose avionics compartment, increased 9,480 lb (4,300 kg) MTOW, expanded lateral flight envelope and Vehicle and Engine Multifunction Display (VEMD) with First Limit Indicator (FLI). First retrofit completed in October 2004. 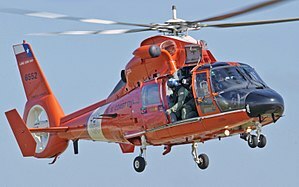 Initially intended only for use by the Multi-Mission Cutter Helicopter (MCH), a further enhancement of the HH-65C within the USCG’s Deepwater effort, includes the installation of a 10-blade low-noise Fenestron, relocated avionics, and an airborne use of force package (in common with that of the modernized HH-60T) which provides the capability to fire warning and disabling shots from the air. The MH-65C is used in “airborne use of force” missions, such as the Helicopter Interdiction Tactical Squadron (HITRON) mission taken up by the MH-65C in early 2008. AUF aircraft are armed with the Barrett M107CQ 12.7 mm anti-materiel rifle and M240G 7.62 mm machine gun. The helicopter can also be used for counter terrorism. MH-65C with an upgraded flight navigation system common to Department of Defense helicopters. The first production MH-65D was completed on January 20, 2011 and is fitted with a Honeywell HG7502 radar altimeter, two Honeywell H-764G EGI’s (embedded GPS/inertial navigation systems) and two control display units CDU-7000D from Rockwell Collins. 97 HH/MH-65Cs will be upgraded to MH-65D standard. The MH-65E will incorporate upgrades that will modernize the cockpit by installing digital “glass” cockpit instruments, known as the Common Avionics Architecture System (CAAS), similar to those installed in the Coast Guard’s upgraded MH-60T Jayhawk Medium Range Recovery (MRR) helicopters. The Echo upgrade will also replace the legacy analog automatic flight control with a digital system, and installing a digital weather radar system. The MH-65E model is expected to begin to be delivered to the fleet in 2017.